When you purchased your lawn mower, it had a durable paint job over the entire mower deck. This paint protects the underlying metal from rusting by preventing moisture and oxygen from coming in contact with it. 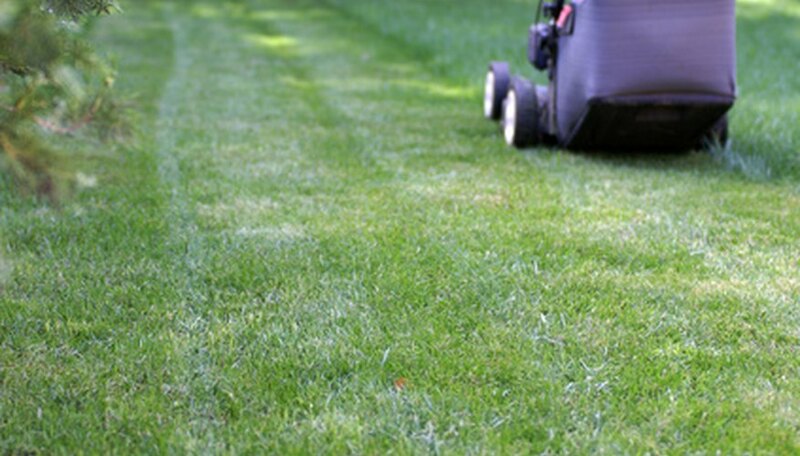 As you use your lawn mower, grass debris will build up over the paint. This traps moisture and can weaken the paint. Also, the mower blade can hurl small stones and other debris into the paint, which can chip it. By following a few simple steps you can prevent your mower deck from rusting through. Use up all the fuel in the gas tank before the anticipated cleaning. Disconnect the spark plug and tilt the lawn mower on its side to expose the underside of the mower deck. Spray the mower deck with water from your garden hose. Use a hose-end nozzle in the "jet" setting to spray a powerful stream. Brush the loosened debris off using a stiff-bristled brush and hot, soapy water. Continue to scrub until all the caked-on debris is removed. Rinse the underside of the mower deck and allow it to dry. Stand the lawn mower back upright and reconnect the spark plug. Repeat the cleaning process after every few mowings. If big nicks or gouges appear in the paint, apply touch-up paint over the blemish. Local paint stores have the ability to match almost any color paint with a provided sample. Spray a light coating of vegetable oil to the underside of the mower deck. This will reduce the amount of grass clippings that adhere to the mower deck. Always tilt your lawn mower with the air filter side up.